In March 2012, the attack of insects “Tomcat” is reported to have occurred. From the photographs of tomcat circulating in the media and the internet, the insect is similar to that reported by my colleague in Malang, Dr. Nurindah, who is also an insect expert. Dr. Nurindah said that in 2004 there was a problem of many small insects coming into the homes of a residential complex in Gresik. The insects appeared in people’s houses at night and the insect fluid could cause blistered skin. Further, in 2007, workers in the oil drilling rig off the northern coast of Java island, located facing Karawang and Indramayu, were reported to experience blistered skins because of the fluid from small red and black insects, similar to that reported to happen in the luxury housing in Surabaya. The identified insects which were found a lot in the oil drilling rig are Rove beetles, with the species name of Paederus fuscipes, belonging to the Family Staphylinidae, Coleoptera Order. Family Staphylinidae is one of the families in the order Coleoptera, with a large number of species in addition to the snout beetle (Family Curculionidae). 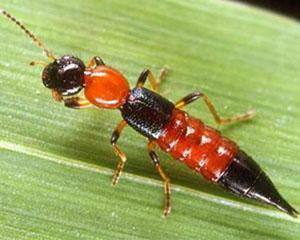 Members of Staphylinidae family are found in Indonesia, but not all of them can cause irritation to the skin. The Paederus genus has approximately 25 species. Some species reported to be able to cause irritation to the skin are Paederus fuscipes, Paederus riparius, Paederus Alfieri, Paederus sabaeus, and Paederus signaticornis. The species often found in the people housing around rice fields is Paederus fuscipes, which usually breed in the rice or soybean plants and act as predators, eating other small insects. Dr. Wayan Winasa and colleagues from the Department of Plant Protection, IPB in 2005 conducted research on the potential of this insect in controlling Helicoverpa caterpillar on soybean plants. Paederus insects are generally attracted to light at night; therefore, at certain seasons these insect are often found in the houses with bright light, not far from the rice fields. This insect has a body length of 10 mm and width of 2 mm. Generally, the male insect is smaller than the female. It has black head, red thorax and partly red abdomen with pointed and tip of the abdomen. The striking characteristic of these insects in addition to the black and red color is the short front wings, covering only some part of the abdomen. Adult insects can fly very well and when not flying, the wings fold back under the front wings (Figure below). Figure 1. Paederus fuscipes that cause Paederus dermatitis in the oil drilling rig off the north coast of Java Island. Actually, the insects do not intend to interfere with human settlements, but rather human beings attract these insects to come into their homes. It is the location of the house (Being near or former rice fields) and the bright light at night that attracts the insects to come into the settlement. Moreover, the harvested rice fields and cultivated land have disturbed the insects’ habitat and food and they look for other habitat in the surrounding. These insects can be found in various places in the rice fields in Indonesia. However it has never been reported to increase and invade human settlements at the same time around the rice fields. It is necessary to be aware when the harvest comes; it is likely for this insect to seek habitat around the fields and be attracted to lights in residential areas around the rice fields. This incident is somewhat different from the attack of hairy caterpillars as these insects basically live in rice fields all the time and eat small insects there. Paederus does not actually bite, but when squashed its body secretes fluid (hemolimfa = “blood”) containing toxin (pederin). When exposed to the skin, it will cause severe irritation, called dermatitis Paederus. The study published in the Dermatology Online Journal shows that patients treated with oral antibiotics combined with topical steroids and oral anthistamin indicate a better response compared to treatment without antibiotics. This suggests that there are bacteria in the wound. The irritation will usually heal in 5-10 days. According to the research conducted at the Department of Bioorganic Chemistry, Max Planck Institute for Chemical Ecology in Germany¸ pederin is produced by the endosymbion bacterial, Pseudomonassp in the Paederus insects. Interestingly the endosymbion is more common in the female than male insects, and can be passed down to subsequent generations through eggs (transovarial). The study results also indicate that pederin can inhibit DNA synthesis and is antitumor. Pederin is actually a toxic substance for the insect’s defense against predators, like spiders, etc. To avoid the coming of Paederus insects to the settlement is to reduce the lighting in the house at night. In addition, a trapping light can be mounted outside away from the settlement so that these insects will be attracted more to the light than to enter the houses. If the insect fluid is exposed to the skin, the affected skin should be immediately washed with water and soap. This reduces the risk of severe irritation to the skin. If many of these insects are around your home, protect your body for example with long sleeve shirts, etc. Construction of shops and houses on wetland would disrupt the existing ecosystem. Apart from the loss of arable land for rice production, the construction on the rice fields would eliminate the flora and fauna on such ecosystem. If this happens continuously, it will certainly lead to ecosystem imbalance and eventually lead to the disturbance caused by animals, including insects, against human life. Thus, environmental impact analyses must still be made correctly for all human activities related to the environment. Very often times we humans are more concerned with economic development rather than preserving the environment; but if a disaster has occurred, the economic loss is often greater.